Do you have a herniated disc, multiple herniated discs, degenerative disc disease, facet syndrome or any other type of spinal problem? Is your doctor suggesting surgery, Pain Management or Physical Therapy? Come to Due West Chiropractic & Rehab and try our Dynatron Decompression Therapy before you try the alternatives. Learn more about decompression therapy at our Kennesaw, GA facility by reading below or calling (770) 429-5555 today! Research indicates that an injured disc can be responsible for a significant number of lower back pain cases, as well as sciatic pain, neck pain and arm pain. Compression of the disc increases the pressure inside of it leading to weakening of the outer disc fibers and possible herniation of the disc’s nuclear material. Why is decompression therapy necessary? The disc is mostly made up of water. Since it does not have its own blood supply, it relies on movement of the neck and back to move the fluid that brings the disc nutrients needed to maintain health and integrity. A compressed disc has a severe lack of -- if any -- movement. This lack of movement deprives the disc of nutrients, creating a high pressure inside the disc. As the disc dehydrates, the inner nucleus tends to migrate to the outer disc fibers. When this nucleus begins to protrude and put pressure on either a spinal nerve or the spinal cord itself, severe pain usually results until decompression therapy is pursued. This pain can stay local and can radiate into the legs, in the case of the lower back; or the arms, in the case of the neck. If the nucleus actually breaks through the outer fibers of the disc surgery, may be necessary. Medication may help with the pain, but no medication has the ability to decrease the pressure inside of the disc, rehydrate the disc or restore the integrity of the disc. Standard chiropractic care can put motion back into the spine, but the disc still remains compressed. Decompression therapy is the only reliable way to return the disc a good state. 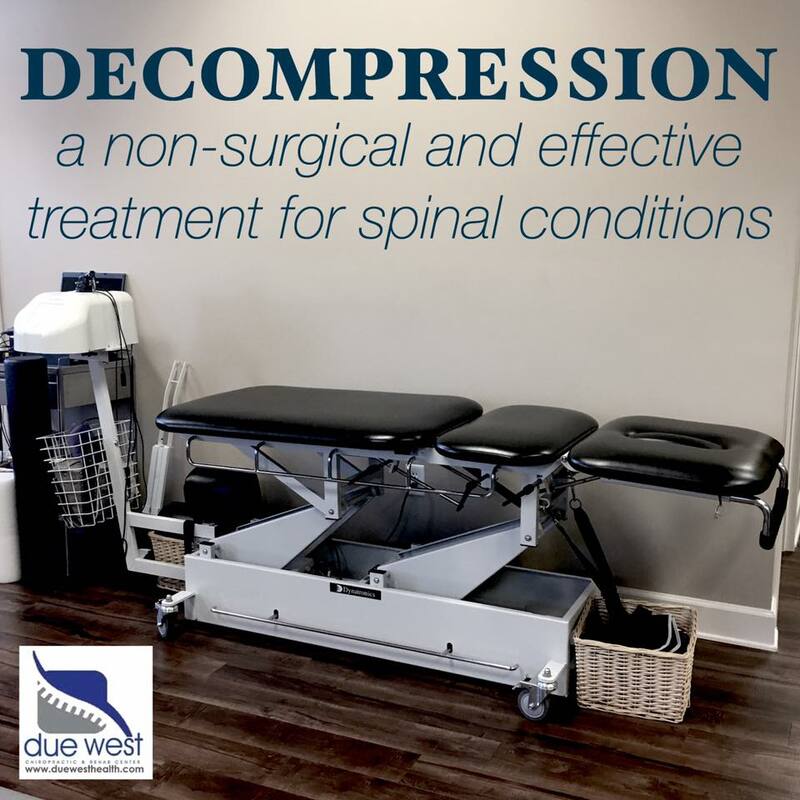 Now with Dynatron Decompression Therapy at Due West Chiropractic & Rehab, we can do more than simply treat your symptoms. We can perform decompression therapy on your disc to remove pressure on your spinal nerves. Not only can we take care of your pain, we can actually treat and rehydrate the disc itself……without surgery! A recent clinical study of 778 patients has shown that Disc Decompression Therapy was more than 70% successful in the treatment of herniated discs, degenerative disc disease, facet syndrome and sciatica. In this same study, 92% of decompression therapy patients had a reduction in their pain. Call Due West Chiropractic & Rehab at (770) 429-5555 today for more information or research. We will be happy to provide more information and offer a consultation to see if you may be a candidate for Decompression Therapy. “When I came to Due West Chiropractic & Rehab, I had sciatic pain, tingling in my left leg and my entire left foot was numb. As a mom of 2 school aged children, the pain interfered with my daily routine and busy schedule. I started a treatment plan that included spinal decompression, physical therapy, and chiropractic adjustments. After the first two weeks I felt significant improvement in the nerve pain and tingling in my leg and foot. After a month of treatment, I have no sciatic pain and the tingling and numbness are completely gone! Thanks to the wonderful caring and fun staff, I am back to all of my daily activities pain free!”- Mary L.